Alyssa was born and raised in Pittsboro, North Carolina. She has a basset hound and two cats named Max, Amos, and Socks. Alyssa also hopes to one day have more pets, and maybe even own or work at a rescue. 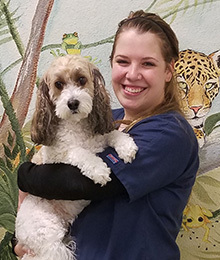 She has owned and loved animals her whole life so she is very excited to be apart of the staff here at Dogwood.